Barco, the innovator in LCD video walls, and Vogel’s, a global leader in mounting solutions for AV equipment proudly announce the new compatibility of Barco UniSee® with Vogel’s Universal video wall solutions. 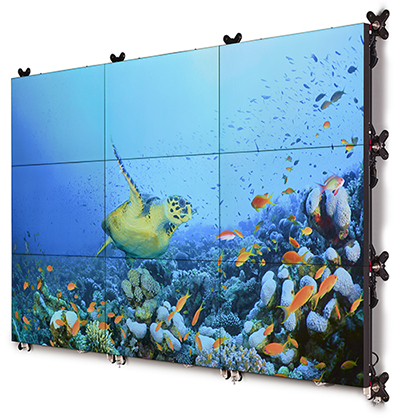 Using a specifically designed adapter, a Barco UniSee® video wall can now be connected to the ceiling and/or floor, or be used as a free standing installation. These pre-validated and tested solutions will be globally available by the end of March, 2018. One of the most innovative features of Barco UniSee® is the specifically designed mounting structure that uses the power of gravity to perfectly align the individual displays at any time, ensuring a perfect installation and easy and damage-free servicing. 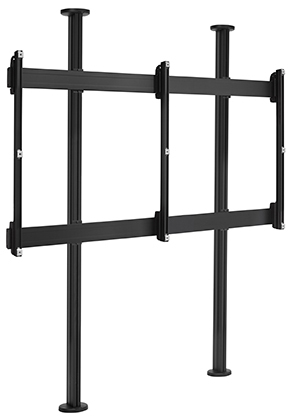 This mounting structure is a must-have to support UniSee bezel-less LCD video walls. Until now, the UniSee® Mount could only be attached to walls, but a purpose-designed adapter (part of the UniSee® Mount package) now allows it to be easily connected to a Vogel’s Universal video wall solution enabling a ceiling-, floor- or a free standing mounting solution. Vogel’s renowned mounting structures excel in both quality and easy installation. The Universal video wall mounting solution has been field-proven over the years and features in many installations around the world. Dedicated versions exist for floor to ceiling, fixed to floor, freestanding floor, free hanging ceiling, ceiling to wall, floor to wall set-ups. This gives an unparalleled freedom to position the LCD video wall exactly where it needs to be. For more information, visit Barco's website on www.barco.com, follow Barco on Twitter (@Barco), LinkedIn (Barco), YouTube (BarcoTV), or like Barco on Facebook (Barco). For more information, visit us on LinkedIn (Vogel’s Products BV) or YouTube (VogelsExperience).